Tried and True Parenting Hacks to Make Life A Little Bit Easier! Our friends at Kids & Company have pulled together some parenting hacks to help with a smoother morning routine. They reached out to their staff and parents and here are some of the tried and true hacks they’ve discovered along their parenting journey. Do you have a picky eater who refuses breakfast? 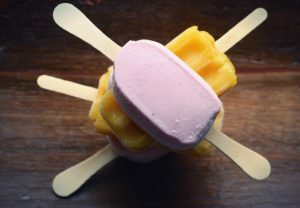 Try making a frozen homemade yogurt popsicle! It can be eaten without much mess in a car or even on public transit. You can feel good knowing your child has eaten a healthy quick breakfast on-the-go and they think they're having a special treat! Win-win! Struggling to get dressed for daycare? If getting your toddler/preschooler ready is like a reoccurring nightmare, don't sweat the small stuff. Simply pack an easy to change into outfit. You can pack sweat pants and a top, socks and underwear, this way your child can change into their day clothes at day care. If your child still refuses to change out of PJs, it’s okay! Just ensure they’re wearing their snow pants over their pajamas. Snow pants will keep them warm in the cold winter months! Super early start one morning to catch a flight or first-thing activity? You can try this hack: put your child to bed wearing their “day clothes” so you can get up and go. Another has a similar hack: We use a kitchen timer so everyone knows when we are supposed to leave. With 15 minutes left, I say ‘15 minutes’. I set the timer for another five minutes and when it goes off I announce ’10 minutes left.’ And when the next goes off again, we head for the door. For those who live in a building, you can save some extra time by this hack shared by one of our parents: we are in a condo – all shoes and winter gear are put on in the elevator… we are high up! We have two kids. To help with organization I have a shoe bag (the one you hang in the closet with horizontal slots) in the kids’ room. I take out their PJ's and clothes for the week on Sunday and each outfit goes in its own slot. This saves so much time! If your little ones are deep sleepers, consider trimming fingernails and toenails at night to avoid a squirmy and stressful process. We never bring a diaper bag anymore but always stash some diapers, wipes, snacks and a change of clothes in each car. I don’t know why but kids lose one sock out of every pair on what it seems on average every 17 seconds. I’ve seen hacks like ‘wash them together in a mesh bag’ or ‘safety pin them together before washing,’ but the danger zone is before washing, when they’re still in the custody of my children. So now we just buy A LOT of the same colour, length and size and replenish as needed. If you’ve got a little baby, have mini diaper change baskets in various areas of your house with some diaper cream, wipes, diapers and other necessities. Even a trip to the nursery to change a baby can feel tiring if you’re on no sleep with a newborn. For toddler fingers learning fine motor skills, try attaching a keychain to their zipper to help them grab and hold easier and pull it up. Plus if the keychain happens to be a fun toy that motivates them to get dressed and going, bonus! When stressed: Sing a song ♪ Children respond to song cues in childcare and the same can work at home. Try the cleanup song. Or transitions are easier with a song. Maybe a specific playlist/song can be used to cue your child when a transition is about to happen. A five minute song is preferable to, ”we need to leave in five minutes," for a child who has no idea what five minutes is. There is no app that replaces a parent's lap -- read to your child when using public transit or if someone else is driving turn off the radio and sit in the back with your child and read to them. Try bringing a small softcover book for reading in waiting rooms and line-ups. When unable to read - when you're driving or in a loud bus or subway a great alternative is an audio book in your car or with your iPhone and children's earphones on transit - Stories encourage imagination, increases children's attention span and literacy! 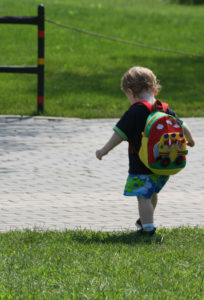 Older children often like the idea of "Big Kid School" so transitioning by having them choose a back-pack before moving from toddler to preschool can help them feel excited. Or go shopping for new shoes or an outfit or special t-shirt for their first day of preschool, much like the first day of kindergarten. Label everything you bring into day care! A special thanks to our parents and teachers who submitted their tried and true parenting hacks. Sharing your tips has made the lives of many parents a lot easier! Natasha Carr is the Events and Marketing Coordinator for Kids & Company. She is a mom of two young children who constantly find ways to make her and her husband laugh on a daily basis.